Here’s what’s up in the world of TV for Tuesday, September 17. All times are Eastern. 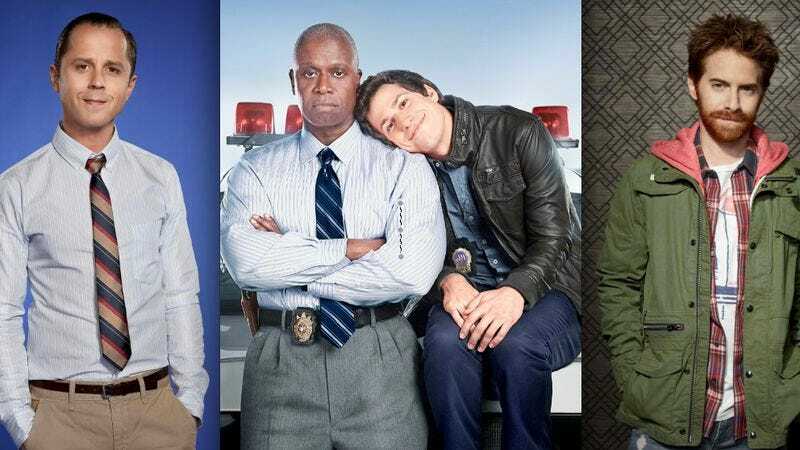 Dads/Brooklyn Nine-Nine (Fox, 8/8:30 p.m.): Fox had a real shot at digging itself a nifty little must-see nook of okay to great (see The Mindy Project and New Girl, respectively, below) comedies on Tuesday nights—and then it went and ordered the wretched Dads to series, anyway. But all’s not lost, because the network also booked the fall’s most promising sitcom, Brooklyn Nine-Nine, the cop-show hijinks of which begin washing the bad taste of Dads out of your mouth tonight. Molly Eichel reports for duty in the 99th precinct; we’re trying to ignore Dads until it just goes away, but Todd VanDerWerff has some thoughts on the first two episodes. New Girl (Fox, 9 p.m.): Cliffhangers will be resolved—or will they? Erik Adams will enjoy seeing Schmidt hem and haw through deciding between Cece and Elizabeth—or will he? Or maybe he’ll just devote all his attention to Winston attempting to solve a puzzle. The Mindy Project (Fox, 9:30 p.m.): James Franco welcomes you to James Franco’s deconstruction of the single-camera sitcom, in which James Franco holds a mirror up to the conventions of the romantic comedy and dares the genre to laugh in its face. Katherine Miller watches on, perplexed by James Franco’s motivations but entranced by his passion. Frontline (PBS, 10 p.m.): The venerable newsmagazine begins its 32nd season with a look at the situation in Egypt. Phil Dyess-Nugent helms The A.V. Club’s intermittent coverage of Frontline’s 32nd season with a look at the venerable newsmagazine’s look at the situation in Egypt. Suits (USA, 10:01 p.m.): The time has come to remove the seersucker suits of summer and replace them with heavier, more outwardly substantive suits of the fall and early winter. When Carrie Raisler next sees Harvey and Mike, their suits will probably be hidden under layers and layers of thick, downy protection against winter weather. Six Feet Under (1 p.m.): When one of the most dependable season-finale events (a funeral) is your everyday setting, how’s a cable drama to end its third season? Why a surprise wedding, of course—and death, death, death. John Teti apologizes for doing a better job of bumming you out than any of the new fall shows. The Office (Classic) (3 p.m.): And Erik Adams apologizes for doing the same, as he takes a look at the finale that caused a seismic shift in the world of Dunder Mifflin. Latino Americans (PBS, 8 p.m.): Benjamin Bratt narrates an epic portrait of the Latino experience, which attempts to distill 500 years of history into six hours of TV. Good luck with that, documentary! The 99 Percent: The Occupy Wall Street Collaborative Film (Pivot, 8 p.m.): You’d think a profile of a movement as succinctly named as Occupy would have a similarly catchy-and-evocative title—but maybe that’s the drawback of making a movie that features the contributions of 99 filmmakers. I Dream Of NeNe: The Wedding/The New Atlanta (Bravo, 9/10 p.m.): Real Housewives power couple NeNe and Gregg Leakes give marriage another go—much as Bravo hopes that reuniting with the Leakes’ hometown (and the various hotheaded personalities that live there) will feel so good. 19 Kids And Counting (TLC, 9 p.m.): A Duggar leaves the family compound, which would prove emotional were it not for the fact that their giant house is occupied by enough people to field two competing baseball teams. Iron Man 2 (ABC, 8 p.m.): While Fox begins rolling out its new series, ABC would like to remind you that none of those new series are the television expansion of a highly profitable (and usually entertaining) series of superhero movies. But if the network was truly doing that, maybe they should’ve gone with Robert Downey Jr.’s first time in Tony Stark’s metallic shoes. Raising Arizona (Sundance, 8 p.m.): Presenting a child-rearing alternative to 19 Kids And Counting, featuring just as many allusions to the Bible and a greater amount of highly symbolic footage where John Goodman “births” himself and William Forsythe from below the ground. Sleepy Hollow: We’re unsure how any could’ve missed Sleepy Hollow, seeing as it’s only the fall’s biggest potential disaster-turned-compusively watchable curiosity. (Also: David Sims told you to watch it in this review.) Zack Handlen certainly didn’t miss it, and he has more post-episode thoughts on the premiere than you can stuff into George Washington’s Bible.